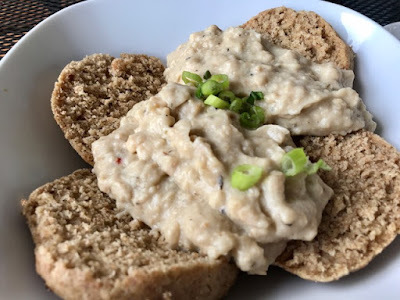 Our friends Don and Kenzie of Lulu's Baked (a pop-up restaurant/bakery/cheese maker/pizza cult leader) hosted their second pop-up vegan brunch at Fuel Cafe, where Don works by day as a pizza chef. Fuel is closed on Sundays, unless Don is hosting a special brunch! A few weeks ago, a few friends and I attended the first brunch, and you can read all about that here. This second brunch was all about the biscuits! Don is a master breadmaker, so he made lots of sourdough bread for the last event. And this time, he created hundreds of flaky, melt-in-your-mouth biscuits. The biggest hit was the Breakfast Slider Plate, which most of us, including myself, ordered. 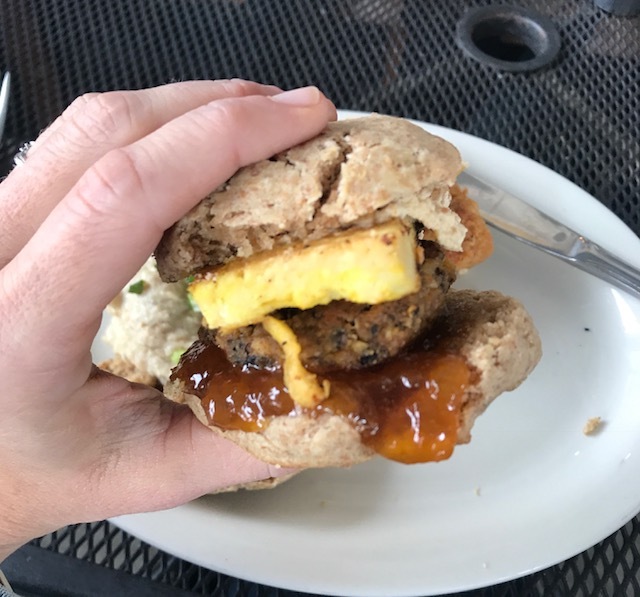 This had biscuits and country gravy, a biscuit slider with chicken-fried tofu and a peach pickle, and a slider with blackeyed pea sausage, cashew cheese, tofu egg, and jam. SOOOOOOO GOOOD. I wish I could eat this for brunch every weekend. The chicken-fried tofu slider was a table fave! And he should really start selling his blackeyed pea sausage because it's stuff of magic. I also ordered a cup of coffee, which was served by a woman who roasts beans locally. The beans are sourced from central Kenya. They're wet-processed and sundried. The brew was tart and almost cranberry-like in flavor. Very different from the beans I'm used to but very good. I'm working on being a better coffee snob. Simon deviated from the rest of the table and ordered a plate of Biscuit & Gravy — just a bigger portion of what was on our slider plate. He also ordered the Gazoz, a ginger/peach/rosemary soda, which was made to order. A few people also ordered sides of Chunky Potatoes. I knew the slider plate would be enough for me, so I didn't. But they looked good. Here's the full menu. I saw a few people in the restaurant with bowls of the Tomato & Tofu Breakfast Stew, and it looked very good! I almost asked a random stranger if I could take a picture of his food, but then I thought better of it. I loved that they included this note about the sourcing of ingredients. It highlights the local products, as well as the ethicalness of each ingredient. It's nice to know where your food comes from. They also included a note about the average rent price in Memphis versus how much people make, and it's startling. Nice little social justice fact thrown in! Lulu's next pop-up brunch at Fuel Cafe is September 30 from 11 am-2 pm. Be there! Wow, this looks incredible! You just can't get that sort of biscuit here in Australia. I make my own sometimes, but I don't have the skillz. But I love having them when I am in the US! Though here in Australia, biscuits are what you call cookies. I told an Australian colleague that I was going out to have biscuits and gravy for breakfast when we were in Indianapolis, and she was horrified. It took me half a day to realise she probably thought I meant sweet biscuits! I've tried to make delicious biscuits and like Susan I just don't have those skills! A peach pickle sounds so interesting to me! OMG YES!!! This all looks so good! Biscuits were one of my favorite things but I'm too lazy to attempt to make my own! These all look amazing! I"m such a fan of all things breakfast so this post is everything I want in my life! What a meal! It’s impressive and obvious how much care goes into the menu and sourcing, i wish i was close enough to go myself. Pizza & Oatmeal & Tater Skins! Tacos & Sandwiches & Pizza! Pizza & Pie & Bowls! Oh My!